Through blogging I met a new friend Rhonda who blogs at Ramblings of a Southern Girl. Rhonda recently did a fun post on how to style a shelf (shelfie) as she put it and she also had a fun giveaway. She featured this cow cup and I was chosen as the winner and she also included caramel candies. It was such a shock and pleasant surprise to me and so sweet and thoughtful of Rhonda. Please stop by and visit Rhonda's blog where she shares about recipes, interior decorating, and much more. When I showed the cute cow cup to my husband and teen, they both said that it was so adorable, and I totally agree! I have the cow cup sitting on my kitchen counter and I'm using it to hold our sugar packets. Look how darn cute the cow cup is! Thanks again Rhonda for selecting me as the winner of your giveaway and for our new blogging friendship! On my blog I enjoy sharing with you the recipes that I make and cook for my family and friends. What I really love and get excited about is when I get feed back from you and some of you make the recipes I make and share such as the Grilled Fish with Asparagus in Foil Packets. Below you can see a photo of fish that Kitty sent me, from Kitty who blogs at Kitty's Kozy Kitchen. She made the fish for dinner and sent me the photo of it. If you haven't met Kitty yet, please visit her blog where she shares her crafts, and recipes that she enjoys baking for her family and friends. Thanks Kitty for making the grilled fish. I'm so happy I inspired you to cook it and I hope you enjoyed it as much as my family did! I also have another blog friend who enjoys cooking vegan dishes for her family. 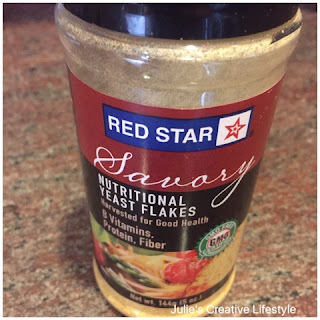 Heather who blogs at Our Life in a Click uses an ingredient called Nutritional Yeast Flakes in many of her recipes. Please take a minute to stop by Heather's blog where she shares posts about her recipes, travel, and family. I have a teen who is very interested in vegan and vegetarian recipes. I was so inspired to buy this ingredient from Heather's recommendation. Thanks Heather we use it now to sprinkle it in our soup and on our pasta. Below is a photo of the nutritional yeast flakes that I bought in our health department of our grocery store. If you have never heard of nutritional yeast flakes before it has a nutty and cheese like flavor to it. You can read more about it HERE. There is another thing that I enjoy about blogging, but it can be very time consuming at times is joining link parties. There you share your projects and then if you are lucky you will be featured. 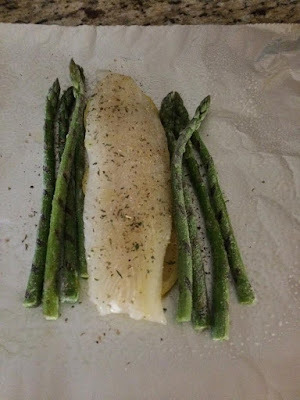 Last week I had a few blog buddies Miz Helen's Country Cottage, Domesblissity, and Rooted in Thyme feature the Grilled Fish with Asparagus in Foil Packets I made for our family. Thanks blogging friends you are the best and lets keep inspiring each other!! Thanks so much Julie it is always fun having you join us for Full Plate Thursday. Your Fish packets were awesome! Isn't it fun the virtual friendships you form? I've been tempted to try nutritional yeast. I'll have to see if I can find it locally! Definitely scoping out Heatjer's blog! I'm more "no dairy" than "no meat". Haven't drank milk since 2011! That chicken asparagus looks amazing! Blogging always joins people together. Have yet myself to do a meet up. I will check out Rhonda's blog Julie. Thanks for sharing. I love meeting new blog friends too. Blogging has opened the door to a world of wonderful new friends for me. 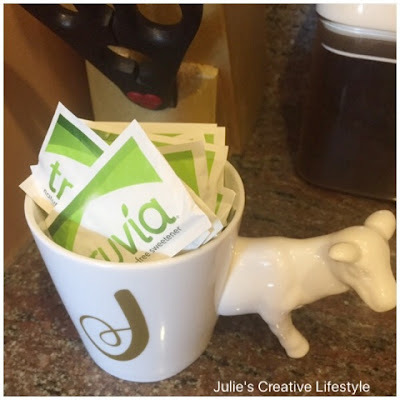 What an adorable cow cup, Julie! I agree, our blogging friends are so special, and it broadens are world so much. Thank you for sharing my picture of your awesome fish packets that I made. I'm looking forward to making them again. What a cute cow cup! I am sure you can't help but smile everytime you see it. Such a coincidence, I also won a giveaway recently and got a teacup and some snacks. Making friends and sharing with them is the best thing about blogging, no doubt. That's an interesting cup. I've never seen one like it before. It's cute. I won an apron when I first started blogging, through one of the blogging parties. Congrats on the win! That cow cup is adorable! Ive won a ceramic memo pad once. I love my blogger friends. Thanks so much for the shout out. How awesome!!! I agree about the many personal benefits of blogging and getting to know so many nice people! Aw, the cow mug is so unusual and totally adorable! I agree that meeting new people and making friends is the very best part of blogging! Have an enjoyable week! I am with you Julie! I blog to meet new people and to form friendships. It is fun to share our lives with each other through all that we post. That cow mug is so unique and cute! I get so much inspiration from other bloggers, so thank you for introducing me to some I do not know. Your post is what it is all about....sharing and supporting each others ideas! Julie what a sweet win! The cow cup is too adorable. Love that you have your sugar packets in it. I tried the fish and asparagus the other night too and it was really delish. Thanks for sharing that one it is a good one. 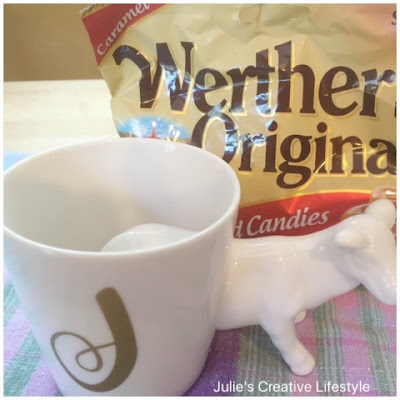 Hi Julie, Love the adorable cow cup. Too cute and perfect filled with your sugar packets. Yes, blogging does bring us so many wonderful friends along with amazing creative ideas for recipes, crafts and more. I'm sure Kitty enjoyed the fish and asparagus dish. Her pic looks delicious! I agree, Julie...friendship and community has been the best part of blogging!! Love the prizes!! Hi Julie! I wasn't able to comment on the blog because I only brought my phone with me:) What fun that you've won the cow cup! And it's so cute the way to stash your sugar packets in there. Blogging is truly a way to meet up and get to know each other (while blogging). I love the way the blogging community has delevop in this way. Thanks for sharing other blogs here and will sure go and give a visit. What a happy post Julie! That cow cup is just darling. Such a sweet post Julie! I'm sure all your readers, including me, feel the same about you! I've loved our friendship over the years julie.if I ever get to new York you'll be one of the first people I look up. Congrats for being Rhonda's lucky winner Julie! I have read a little about nutritional yeast, and am very interested in trying it. Did you use it on your soup and pasta in lieu of Parmesan?